It was in the early 1980s that New York investment banker Herbert Allen was looking for a location to organize annual meetings for his main client base consisting of Hollywood producers and media tycoons. By 1983 Allen had settled on the Sun Valley lodge In Idaho for this purpose. This lodge already had an established history. It was built by Pilgrims Society member Averell Harriman in the 1930s. Since that time it regularly served as a meeting place for the most influential businessmen in the West. Allen continued the tradition. Left: Rupert Murdoch and his asian wife together with Google's Sergey Brin. Mid: During these 5 days, the local airport is filled with private jets. Right: Warren Buffett with his daughter Susie. At the first meeting in 1983 only 35 businessmen were present, but this number grew rapidly when the location turned out to be an ideal location for a brief get-away and a little networking. These days, the meetings have expanded to a few hundred participants each year in July. This number includes the wives and children of the invited participants, who can amuse themselves with tennis, hiking, biking, kayaking, golfing, and a variety of other activities. Since at least half of the guests are billionaires instead of millionaires, most of them fly in on their own business jets. During the event presentations are given about a variety of subjects, a lot of them dealing with finances. At the moment of this writing, I have found just over 100 participants of the Sun Valley meetings. Below the reader can see a list of companies these people control. Many additional names can be added if one starts looking at all the directorships, but the companies below have been represented by a chairman, CEO, president, or majority shareholder. Many of the companies above own one or more others in the list and some of them may well have merged by the time the reader comes across this article. In any case, all of the large Hollywood studios are represented and TV channels like ABC, CBS, CNN, FOX, NBC, MTV, the Discovery Channel, the History Channel, National Geographic are all owned by the corporations above. The same goes for a huge amount of newspapers, magazines, and radio stations. Europe is also represented. Rupert Murdoch owns British Sky Broadcasting and several newspapers in the UK. The German media company Bertelsmann, represented by CEO Thomas Middelhoff, owns 90% of RTL Group, which is the number one TV and radio broadcaster in Europe. The second largest european television company, SBS Broadcasting, is owned for 21% by Liberty Media through UGC Europe. The founder and chairman of SBS is an American - I'm not sure if he attends the Sun Valley, however. Vivendi Universal Entertainment is owned by the French Vivendi Universal, which bought Seagram from Edgar Bronfman in June 2000. Unfortunately, the Sun Valley meetings are never mentioned in Europe, so names from this side of the pond are in rather short supply. Former CIA director George Tenet leaves the conference after having given a lecture on terrorism. The only British visitor I came across is J. Gordon Brown, an influential chancellor of the exchequer who is very close to prime minister Tony Blair. When Brown came to power as chancellor of the exchequer he immediately surprised everyone by giving the Bank of England operational independence from the British government in the conduct of monetary policy, which is very similar to the Federal Reserve of the United States. In addition, Brown is chairman of the IMF's International Monetary and Financial Committee and a member of the Privy Council. Looking at the NGO and elite social circuit, Brown, predictably, is a member of Bilderberg. He can also be found in the extremely aristocratic Other Club, over the years together with the Duke of Devonshire (Cavendish), the 7th Marquess of Salisbury (Le Cercle), Lord Carrington (Pilgrims Society president), Lord Richardson of Duntisbourne, Lord Jacob Rothschild, Lord Rees-Mogg, Prince Charles, Lord Julian Amery (former head Le Cercle), Lord Kelvedon (Le Cercle), Tony Blair, Sir Edward Heath, Sir Denis Thatcher (husband of), and Winston S. Churchill (grandson of). It's one of the most elite private clubs in Great Britain. Brown also attends meetings of the London-based and quite moderate Institute for Jewish Policy Research (JPR) - the former Institute of Jewish Affairs - of which Lord Jacob Rothschild is honorary president. At times, the institute receives visits from the Israeli ambassador. Lord Rothschild also organized at least one party at J. Gordon Brown's house, so it's clear that Brown is tightly connected to the powers that be. If a Rothschild has ever attended a Sun Valley Meeting is unknown. The entertainment business doesn't seem to be a primary interest of them. Apart from Brown, Sun Valley participants Warren Buffett, Rupert Murdoch, Frank Biondi and Vernon Jordan are all friends of either Sir Evelyn de Rothschild or Jacob Rothschild. don't have a policy against discussions on politics and business. Clearly, just about the only parallels between the Bohemian Grove and the Sun Valley Meetings is the concept of an elite summer vacation and the fact that the media is kept at a distance. 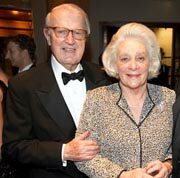 2010 update: Turns out that a senior advisor to Allen & Co. since 1984 has been William vanden Heuvel (here standing next to Happy Rockefeller, widow of Nelson Rockefeller). Vanden Heuvel, close to the MCA (see bio of Lew Wasserman of the 1001 Club for this company's mob links) and The Nation through his wife and daughter, also was a director of Time Warner. Vanden Heuvel was OSS, a director of the William J. Donovan Foundation until it was taken over by the Pilgrims Foundation in 2002. Then he became secretary of the Pilgrims. At the W.J. D. Foundation he shared the board with the notorious General Singlaub and Frank Wisner, Jr., and also with the daughter of William Casey and 1001 Club CIA agent/businessman Francis Kellogg. Controversy always looms in the background when researching the superclass. Though there are enough individuals of slightly controversial reputation attending the meetings, the Sun Valley generally doesn't seem to be visited by persons of really questionable reputation, such as is the case with national security related groups as Le Cercle, the AFIO, OSS Society, or the old American Security Council. It is true that the individual companies have occasionally been accused of indulging in improper labor policies and the like, but there's no specific trend here among Sun Valley participants. Sun Valley retreats aren't really that secret anyway, especially not since the arrival of the internet. The fact that membership lists are not provided to the public and guests are asked not to speak to the press changes very little. The meetings are held at the exact same location each year and individuals do not exactly go out of their way to hide their identity. Thus it has been fairly easy for reporters to figure out who enters and leaves the compound each year. As the references section of this article demonstrates, plenty of articles have been written about the Sun Valley Meetings, even in very establishment media outlets as the New York Times, Forbes, and Time magazine. The only really inconvenience is that generally the same three line history and the same names are mentioned time and again, but superficial copy-paste-rewrite reporting is the norm of the media. Among the best sources for identifying members has actually been Associated Press photo galleries of the event, which were never properly turned into articles. Still, it's clear that what is discussed in the Sun Valley is not particularly sensitive. Even reporters are occasionally invited to attend and write about the event. In contrast to some of the other groups ISGP has been digging into, the Sun Valley Meetings turn out to be rather innocent. It's still interesting and important to have a good sense which superclass members visit which private conferences, and maybe the masses should always push for more insight in what is discussed at these elite meetings, including the Sun Valley, but there definitely are other NGOs out that there that deserve more attention at this point, at least to ISGP. Of course, if anyone is interested in researching the independence - or the lack thereof - of the mainstream media, the networking that goes on at the Sun Valley Meetings could be an interesting area of research. Investigating the mainstream media hasn't been the purpose of this article, however. The purpose has been to get a sense what the Sun Valley Meetings are about. And in that objective this article appears to have succeeded to a large degree. August 14, 1995, Time Magazine, 'Easy as ABC': "... And it wasn't just any parking lot. It was at a Sun Valley, Idaho, resort last month, where investment banker Herb Allen annually gathers the Men Who Own the Media and other titans of industry to play golf and go river rafting and rearrange the planets. Eisner was getting ready to leave when he ran into Buffett, exchanged some pleasantries and then popped the question. "Do you think ABC is still for sale?" he asked Buffett, who ought to know, since he owns 13% of the company. As it happened, Buffett was on his way to meet ABC chairman Tom Murphy for a friendly game of golf. Just to keep things interesting, the foursome would be rounded out by the richest man in America, Microsoft chairman Bill Gates, and Gates' wife. By the end of the day, Murphy had lost $2 to Buffett and $3 to Gates, and he had agreed to call Eisner the next week to plan the wedding... "
July 1, 1996, Forbes Magazine, 'Herbert Allen and his merry dealsters' [link]. July 26, 1996, New York Times, 'For Rupert Murdoch, International Influence Outweighs Wealth': "It was vintage Rupert Murdoch. On Thursday evening, July 18, Murdoch, the Australian-born Chairman of the News Corp., and the American entrepreneur Ronald Perelman lingered after dinner on the outdoor deck of the investment banker Herbert Allen's home in Sun Valley, Idaho. Perelman had wanted to sell his company, New World Communications with its 10 television stations, to Murdoch for months, but the two had haggled over price. Now Perelman was playing hardball, threatening a deal to shut out the News Corp. "He had me over a barrel," Murdoch conceded. And so, dismissing concerns of some of his own executives, on the following Sunday night, Murdoch, back at his ranch in Carmel, Calif., called Perelman on Long Island. By Monday, they had a deal. Critics said Murdoch would be paying a steep price, $3.4 billion, for stations that already carried his Fox Network. But the deal would make Murdoch the biggest owner of television stations in terms of viewership, reaching 40 percent of the United States, and a true contender with the major networks." November 17, 1997, Time Magazine, 'A new world at Sony': "The invitation said casual, although the occasion was anything but: dinner at the media moguls' summit, an annual gathering at which financier Herb Allen played host at his Sun Valley digs. Nobuyuki Idei was late and tired, and since he was still wearing a suit, he looked like the carbon-copy Japanese manager that Hollywood had taken to the cleaners in recent years. So the Sony Corp. president doffed his jacket and donned a Men in Black T shirt for his big entrance. "Just a little marketing gimmick," jokes Idei. "But the guests congratulated us." Idei got hoots of approval for Sony Pictures Entertainment's biggest film of the year from the likes of Disney CEO Michael Eisner, Intel boss Andy Grove, Seagram's Edgar Bronfman Jr., Time Warner's Jerry Levin and DreamWorks' Jeffrey Katzenberg, to name a few. Idei, 59, is the first Japanese to crack this exclusive club, a symbolism not lost on Howard Stringer, president of Sony's U.S. subsidiary. "He is a player," exults Stringer, the former CBS network boss brought in by Sony to clean up the mess at its U.S. operation. "He is young, dynamic, and he is taken seriously by this crowd. It's in the ether now."" July 18, 1998, BBC, 'Brown tells Murdoch: No deal over euro': "Chancellor of the Exchequer Gordon Brown is returning home from the USA after telling global media tycoon Rupert Murdoch that the UK's policy on the euro is not negotiable. Mr Brown faced executives of Mr Murdoch's News Corp in Sun Valley, Idaho, and signalled that the government remained determined to slap down demands for a change on European monetary policy, led by the media baron's newspaper The Sun..."
July 20, 1998, Time Magazine, 'Power Camps': "While you've been packing the RV for that cross-country drive with the in-laws, the world's power elite has been jetting off to more exclusive sleepovers. Last week Hollywood and Wall Street names trekked to Idaho for the Allen & Co. conference, one of a handful of camps at which ambition burns hotter than any campfire. Our guide: ALLEN & CO. WHEN HELD Early July each year. FOUNDED New York investment banker Herb Allen, who specializes in media deals, organized the conference in 1983. LOCATION The Sun Valley Lodge in the lush mountains of Sun Valley, Idaho, a winter ski resort about 6,000 ft. above sea level and accessible most easily by gas-guzzling private jet. WHOM YOU'LL SEE About 300 of Wall Street's and Hollywood's most powerful and famous (and about 100 of their glittery offspring). This year: Rupert Murdoch, Bill Gates, Warren Buffett, Andy Grove, Barry Diller, Michael Eisner, Diane Sawyer (a longtime friend of Allen's), John Malone, Geraldine Laybourne, Diane von Furstenberg and Jerry Levin. DRESS Very casual. "Jeans are the dress of the day," says a spokesman. And an Armani T shirt perhaps. RECREATION Hiking, fly-fishing, an annual raft trip, golf, tennis and hanging out are all popular, but the most pressing activity is dealmaking (and posing for the annual Annie Leibovitz photo). The Disney/ABC merger originated after Eisner and Buffett met on a Sun Valley golf course. Any new deals at this year's conference? Stay tuned for the next few months. SEMINAR TOPICS Mornings are for presentations on different companies and panel discussions. This year's presentations are on Nokia, America Online, Loral Space & Communications, Comcast and Disney, NBC, Coca-Cola and Microsoft. HOW TO GET INVITED Be a company president, chairman or CEO at a multinational media concern. And plan to do lots of expensive deals in the near future. EXCLUSIVITY RATING: 9"
July 10, 1999, Associated Press, 'Media titans gather in Sun Valley' [link]. July 26, 1999, The New Yorker, 'What I did at summer camp' [link]. July 7, 2001, Taipei Times, 'Moguls, dealmakers rub shoulders at Sun Valley' [link]. July 16, 2001, Taipei Times, 'Buffett warns against buying Internet stocks' [link]. March 10, 2003, Time Magazine, 'Comeback Crusader': "During investment banker Herb Allen's annual gathering for media moguls in Sun Valley, Idaho, last July--when locals were paid $20 an hour just to be available for baby sitting--Coca-Cola CEO Douglas Daft at one point turned for advice to investment legend Warren Buffett, who sits on Coke's board. What would happen, Daft wondered, if Coke suddenly stopped giving Wall Street quarterly earnings estimates? Buffett answered that Coke's shares would be more volatile and some investors would sell but that these were prices worth paying. Daft would forever "be free from that fiction," Buffett said, according to someone close to both men, and better able to focus on long-term goals. That did it for Daft. This past December, Coke made it official: no more advance earnings estimates. A month later, McDonald's followed suit, and a few days after that, AT&T made it a trend..."
July 15, 2003, Sydney Morning Herald, 'Media moguls relish summer powwow' [link]. July 16, 2003, AllYourTV, 'Commentary: It Ain't Nothing But A Mogul Thing' [link]. July 3, 2005, Associated Press, 'Media Moguls to Gather for Schmooze Event' [link]. July 5, 2005, CNN, 'Sun Valley draws media moguls' [link]. July 7, 2005, Associated Press, 'Media Honchos Face Weaker Ad Climate' [link]. July 8, 2005, Idaho Mountain Express, 'Sun Valley hosts media magnates' [link].